It’s been some time since I’ve posted anything, and for good reason: I’m a new dad again! On January 29, my wife Kelly and our son, Charlie, and I welcomed our daughter Quinn Caroline to this world. Life’s been very busy in the Seifert household, but I’m looking forward to getting back to writing golf-related articles for you all soon. I’m also looking forward to featuring interesting contributing writers… More to come on that soon. We can all be happy Punxsutawney Phil predicted an early spring this year, but I’m not sure I’m buying it after witnessing a mild holiday season that led to massive snow storms and unbearably cold weather. Actual air temperatures hit -30 degrees while we were in the hospital with Quinn, and the wind chill dipped to 60-below! It was bad. I’m excited for the golf season to get here, though, and look forward to playing more new courses this year. I’m especially hoping to check out and review new (for me) private clubs like the Legend courses, Oconomowoc, Blue Mound and others. With two kids under two I know I’ll have to be selective and strategic about my rounds… Challenge accepted. I hope you’re all doing well, enjoying the off-season and maybe even getting in some non-Wisconsin bonus golf. There’s a lot to look forward to, that’s for sure. Happy 2019! In its simplest form, Arccos is an unobtrusive game improvement system that helps golfers improve their skills and enjoyment of the game through artificial intelligence and next-gen data analysis. It puts all the information – historical data, predictive analysis, weather and geographical factors, … – all at players’ fingertips so they’re well-informed before, during and after rounds. At $199.99 for the system (including 13 club grips and one for the putter), I can’t imagine a better golf investment. So how’s it work? With Arccos Caddie, quarter-sized sensors screw in to the end of each grip (there is a special one for the putter). They’re easily paired using the system’s intuitive smartphone app, and with it opened during play, collect and analyze an endless number of data points. 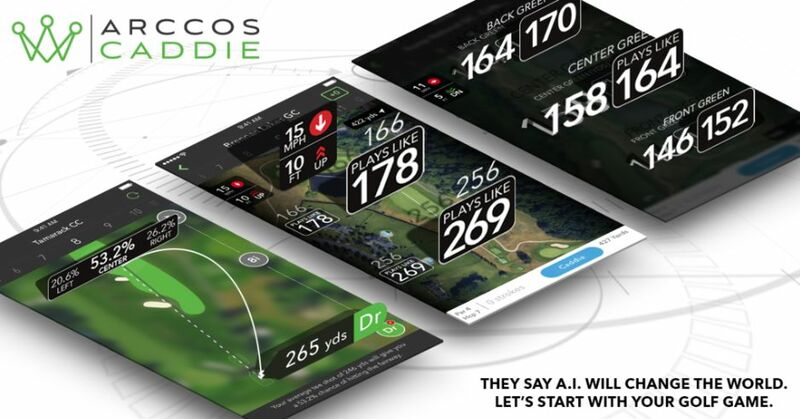 Through a strategic partnership with Microsoft Azure, Arccos Caddie leverages artificial intelligence using the world’s largest database of golf shots, course knowledge and weather conditions. Sensors are activated when upright (not in a golf bag) to preserve battery power, and they track shots via Bluetooth (GPS location, club used, etc.) using your cell phone’s microphone. The Caddie system makes recommendations based on past behavior and course conditions, using inner (60%) distances that disregard values in the 0-20th and 80-100th percentiles. Distances are given to the front, middle and back of each green, along with wind speed and changes in elevation. Even though a lot of people think I’m a long hitter, I know I don’t hit the ball like Dustin Johnson does. You probably don’t, either. Rather than dwell on what you think you should hit the ball, wouldn’t you rather know the distance you actually do hit it? How far do you hit your 7-iron? Most younger, lowish-handicap players will default to saying between 165-180, which is what I figured for myself. With one season of using Arccos under my belt, I can tell you that I hit mine between 145 and 164, and average 154. The max (an outlier) this year was 188. If I’m on a par three over water that needs at least 165 to carry, I am armed with information most players are not. Arccos Caddie also provides “plays like” shot yardage, factoring in actual yardage along with various weather, wind and elevation elements. If I’m on the par three seventh at North Hills Country Club, and it’s 174 yards to the pin and obviously well uphill, all I knew before was I’d need to hit my tee shot more than 174 yards. Using Arccos Caddie, I’m provided all the data and even a club selection that takes every factor in to consideration. Some of that specific functionality needs to be turned off during competitive play, of course, but it’s invaluable during practice rounds and competitive preparation. The third, fifth, tenth, 14th and 17th are really tough holes, but why am I having issues on the first? Especially when I hit the green in regulation 61.1% of the time? 331 down the pipe on a 474-yard par four finishing hole was a great way to end my trip. I can actually go through all the rounds I played last year and relive all my shots. I love that. Even if you’re not a data junkie like me, you can probably appreciate this next fact: Players who purchased Arccos Caddie in 2017 improved by an average of 3.55 strokes per 18 holes. My game was inconsistent at best this year, getting to play just over 20 total rounds, but the handicap Arccos kept for me (8.7) was consistent with my official USGA one. The only negatives I’ve come up with so far are that A) I had a sensor fall off and get lost, B) The Bluetooth app can drain my cell phone’s battery life, C) It can be a little uncomfortable having my cell phone in my pants pocket while golfing, and D) While the putting sensor is more accurate than I expected it to be, it still needs some checking to make sure the right number of putts are calculated. Great products have great solutions, and Arccos can remedy three of these issues. Regarding the lost sensor, Arccos’ customer service was easy to work with and quickly sent me a replacement sensor (they’re available on their website for $19.99 each). For the phone issues, Arccos’ 2018 updates included smart watch functionality, taking the phone out-of-pocket and working instead with the Bluetooth in your watch. I haven’t gotten a smart watch yet, but it’s on my list of potential purchases in 2019. I always confirm the number of putts following my rounds, and it’s really not a big deal. If you have a golfer on your Christmas list, Arccos Caddie or Arccos Smart Grips (sensors are built in to the grips) are a can’t-miss gift idea. Or, if you’re looking for a sure-fire way to help improve your own golf game this year, get it for yourself. Either way, I cannot say enough how much I enjoy using Arccos Caddie, and how highly I recommend implementing it in to your own golf routine. The more I use it, the more valuable data I get… And the more interesting it is to dig in to all the nuances of golf that make the off-course part of the game so much fun. Have you ever seen that beer commercial where the guys are at the tee box and one friend is about to tee off when his buddy says, “Hold on,” and uses his fingers to tighten the fairways and enlarge the sand traps? That is how every hole seems to be on this course. The sand traps are massive, the water features are prominent, and it has a very mature, demanding feel that can be quite intimidating. I first played and reviewed the Brute 12-15 years ago with a friend of mine, Dane, who used to work there. He was telling me that Jim McMahon and Rollie Fingers always played it barefooted, so we did, too. I remembered it being very nice, but was nowhere near the golf enthusiast I am today, and it was like a whole new experience for me with virtually no recollections of that round and how to play it. As a side note, it’s hilarious how many times I’ve had people mention Rollie or Jim McMahon as barefooted golfers during rounds with new golf partners. While WiscoGolfAddict contributing writer John Ziemer and I did not play the course barefooted, we did experience it in a new way: GolfBoarding. Grand Geneva is currently the only golf destination in the state offering GolfBoards for players to use during their rounds. While the surcharge to use them is minimal – $20 over the standard cost that includes cart – the experience is fun, unique and well worth the added charge (my previous post about GolfBoarding can be found here). The Brute is one course that I cannot say enough is worth playing from the recommended tee boxes. Similarly to another of my Wisconsin favorites, Wild Rock, everything about the Brute seems massive and accentuated. The course has an awesome look and feel. Also similarly to Wild Rock, the greens can be really quick and challenging. Many of the greens are crowned, making for really tough downhill putts and a lot of challenging two-putt situations. The Brute starts with a beautifully elevated par four that, like most holes on this course, features water, sand and a long approach. The Brute uses elevation wonderfully, and especially generously on their par fives. The second hole, for example, features an approach area at least 100 yards long that goes uphill and to the left without any fairway to lay up to. Compounding the challenge of this approach is that the green on two is probably the smallest on the course. The majority of their par fives are similar, and [at least from the back tees] I would not consider any of them to be easily reachable in two. The sixth hole has a very similar approach area, and both feature greens that are several stories above [and well over 100 yards past] their playable fairways. The third is a gorgeous downhill par four that narrows to about 15 yards wide between two ponds before going back uphill between greenside bunkers. The water is actually farther away than it at first appears, but driver is likely longer than the landing area will allow. The fourth is one of those par threes that seems to play much longer than the distance. The elevation is relatively flat overall, but goes downhill from the tee boxes over water, then back well uphill to a very wide green complex.